New York Times environment reporter Andrew C. Revkin had a post yesterday that was primarily about an open letter from Judith Curry. Revkin describes her as "a seasoned climate scientist at Georgia Tech .... (who) has no skepticism about a growing human influence on climate." Revkin writes that "Dr. Curry has written a fresh essay that’s essentially a message to young scientists potentially disheartened in various ways by recent events." 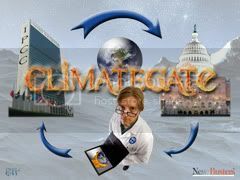 Based upon feedback that I’ve received from graduate students at Georgia Tech, I suspect that you are confused, troubled, or worried by what you have been reading about ClimateGate. .... (one student wrote to me that) "The content of some of the emails literally made me stop and wonder if I should continue with my PhD applications for fall 2010, in this science. I was so troubled by how our fellow scientists within the climate community have been dealing with opposing voices (on both sides)." .... So with this reaffirmation of core climate research values, I encourage you to discuss the ideas and issues raised here with your fellow students and professors. Your professors may disagree with me; there are likely to be many perspectives on this. .... A better understanding of the enormous policy implications of our field should imbue in all of us a greater responsibility for upholding the highest standards of research ethics. Hone your communications skills; we all need to communicate more effectively. Publish your data as supplementary material or post on a public website. And keep your mind open and sharpen your critical thinking skills. My very best wishes to you in your studies, research, and professional development. I look forward to engaging with you in a dialogue on this topic. Curry's correspondence is nice, but peripheral to the core problems Climategate exposes. Short of creating a fresh batch of comprehensive, transparent, auditable, and totally traceable data supporting the existence of AGW, at this point it is currently barely more than a hypothesis -- marginally no better or worse than one which might theorize that the earth is cooling and humans are causing that. The quality of their work, and ultimately their career progress, will be judged not on rigor or merit, but on how well that work fits pre-existing templates. If their work is at first supported but then called into doubt, they will be pressured to tamper with or conceal underlying research data to refute and rebuff doubters instead of engaging their arguments. They may end up in constant, daily, stressful battle with colleagues whose primary interest is in advancing political or ideological agenda. Given that those caught red-handed cooking the books and playing hide-and-seek with the data have yet to see any meaningful sanctions or discipline for what they have done, students would logically fear that if they fight for scientific values when they are compromised by political factors, they will be fighting alone and ostracized by their peers. Though their number is unfortunately shrinking, there are still other fields of life endeavor that don't have this kind of potential ugly baggage. Thus, I believe that Ms. Curry's letter barely scratches the surface in attempting to articulate students' sadly valid concerns.